This is one of my favorites!! It's super easy and i love it!! I start with brushing my teeth and using mouth wash then i use a wash rag to "dry" my teeth and then i put the crest strip it. I leave mine on for 20 minutes like recommended. So typically I'll take a shower or do some cleaning around the house! Take off and wipe extra off. So easy and leave my teeth feeling good!!! 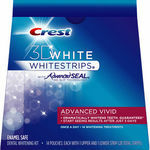 The best on the market when it comes to at home teeth whitening. Even my dentist basically said dont waste your time on expensive whitening trays just go with these babies. Only downside really is that they can cause pain if used frequently enough (as does any good whitener though). Highly recommend! 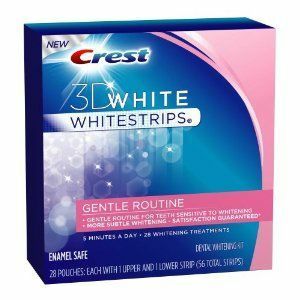 For over the counter whitening, crest strips are always my go-to. However, they are a bit pricey for an at home kit. I love this product so much! I leave it on for 45 minutes and once I take it off I can always notice a difference! I love it so much I also use the whitening toothpaste and after a week there's a huge difference! This product will always be a part of my routine! I would recommend this product to anyone trying to brighten their teeth! It works wonders, I have always tried many products and always come running back to this one. It is pricey but for the results you can't beat it. They are easy to use and can travel with you any where. This is a good product. 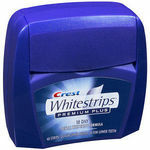 Bought some to whiten my teeth a bit. Fairly easy to put on. Once on the are a little messy. After taking them off I like to brush my teeth to get the gel off. They seem to work. Would recommend using them multiple times per week to see a difference. I love how great these are for at home use! They are perfect for all types of teeth and are not too harsh on your gums! They really do work and make a difference! 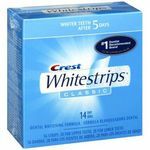 It definitely has professional effects, its duration is incredible and removes stains. So far I have no complaints. Amazing. 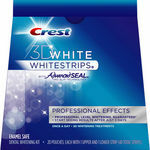 For an over-the-counter whitening product, the Crest 3D White Whitestrips are very effective. 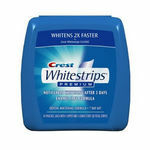 The whitening agent on the strips is a thick gel, and this helps the strips stay in place while whitening teeth. The packaging is very convenient and easy to carry while traveling. The different shapes of the Whitestrips for the top and bottom teeth are effective in providing a snug fit while whitening. Moreover, the strips are long enough that they cover my front teeth comfortably, and extend to cover a couple of teeth on each side of my mouth. This gives me the confidence to smile wide and not worry about my front and side teeth being different shades of white! Also, the strips do not leave a bad taste during or after use. They are a little pricey, and it would be nice to find a comparable product at a lower price. Overall, however, I am very satisfied with this product and would highly recommend it.